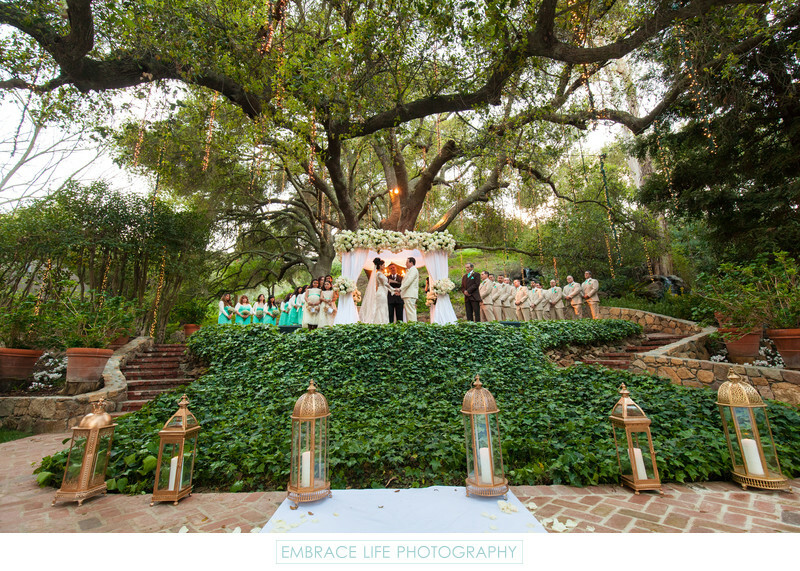 The branches of a magnificent oak tree at this Calamigos Ranch wedding ceremony in Malibu, CA, envelope the bride, groom, and their numerous brides maids in Tiffany blue, lace bridesmaids gowns, and groomsmen in beige suits. Surrounding the couple as they exchange their marriage vows, is a white chuppah, the traditional jewish wedding canopy, lined with gorgeous white flower arrangements by Luna Gardens and the warm glow of a crystal chandelier, suspended beneath it. In the foreground, wedding planner Charley King, of Bluebell Events, placed several large, gold candle lanterns, bringing a touch of elegance to this rustic wedding venue.